Fig. 4. 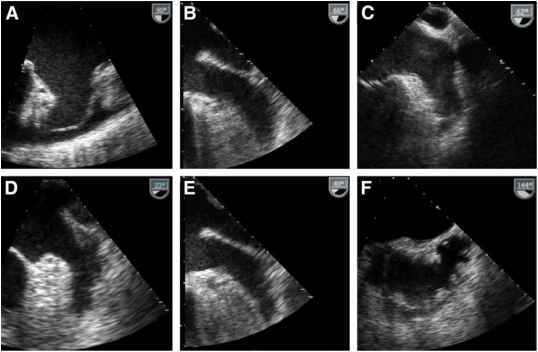 The varied appearance of normal left atrial appearances on transesphageal echocardiography. Normal left atrial appendage morphology can be broadly described as unilobe, bilobed, or multilobed. Note the small pericardial effusion in A. Fig. 5. Color flow Doppler and pulsed wave Doppler examination of the normal left atrial appendage. The normal appendage actively contracts in most individuals as seen on TEE (A,B) or at surgery. This contributes to the complex quadriphasic pattern seen on pulsed Doppler examination. Attenuated left atrial appendage flow velocities Right atrial appendage thrombus cardiovascular hemodynamics) and an expansion chamber for the left atrium—is incomplete. Spontaneous echo contrast is thought to increase the risk of thromboembolism. The most common location of occult thrombus in patients with AF. Thrombus must be distinguished from pectinate muscles that traverse the atrial appendage. 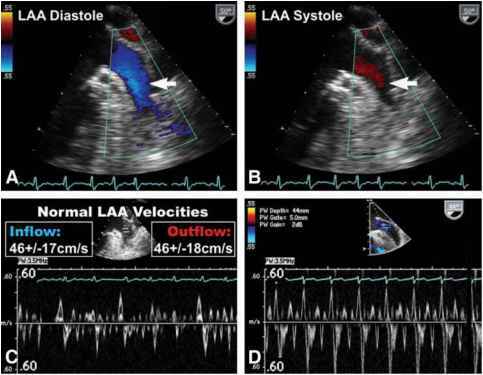 Flow velocities less that 20 cm/s in and out of the LAA is suggestive of stagnant flow. Not visualized by transthoracic echocardiography, thrombus can be present in right atrial appendage. type IV (absent) have been described. Normal right artrial appendage ejection velocity is 40 ± 16 cm/s. Transesphageal echocardiography, systematically conducted, is an excellent tool for complete visualization of the LAA. It has a high sensitivity for detecting LAA thrombi (Table 4), but this is observer dependent. Fig. 6. A systematic examination of the complex left atrial appendage is imperative to "rule out" thrombus. A recommended schema is shown (see Chapter 23). 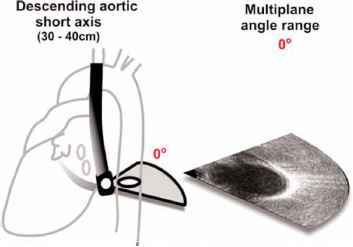 TEE evaluation of the left atrial appendage involves omni rotation from 0 through 180°, with additional counterclockwise (to the left) rotation of the entire probe between 60 and 90°, and again between 110 and 130° (Fig. 6; see Chapter 23). 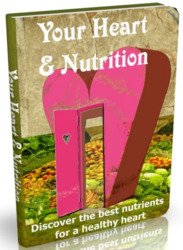 These serve as a guide, with the final positioning guided by optimal visualization of examined structure during each individual study.